Lake Erie. Photo by Andrew Wyton. Georgian Bay. Photo by Chloe Colden. Georgian Bay. Photo by Lucas Murnaghan. The Great Lakes contain 21% of all the freshwater on earth, making these northern inland seas the source of life to millions in North America. Although their waters lay idle when the weather is tame, we have a long history of devastating swells generated by powerful storms. At the bottom of all five lakes lie hundreds of shipwrecks caught off guard through the centuries. Those same destructive storms are the source of an ever-growing community of diehard surfers who believe there are no bad days when you can surf on a lake. These are the surfers who really live by Gerry Lopez’s famous credo, “Surf is where you find it.” Some were born and bred here while others migrated from far off places. Origins aside, we all share a story of discovering surfing here and have a story of how it has shaped our lives. Some people grew up watching waves on family holidays while riding them remained an exotic dream, practiced in places like California and Hawaii. Some may have stumbled across the “Volkswagen-hiding barrels” from Sheboygan in Dana Brown’s film, Step Into Liquid. And others, like myself, had to travel to a remote surf break in the Caribbean to meet a Great Lake surfer in the lineup and find out that one could do this back home. Those living the big city hustle have to endure long work hours to succeed in their urban pursuits. Life in the city doesn’t automatically offer the same slow paced and mindful lifestyle of a small surf town by the ocean. At first sight, we all seem stuck in the concrete jungle. But if you are determined to find what drives your happiness and keeps you sliding forward, you will. 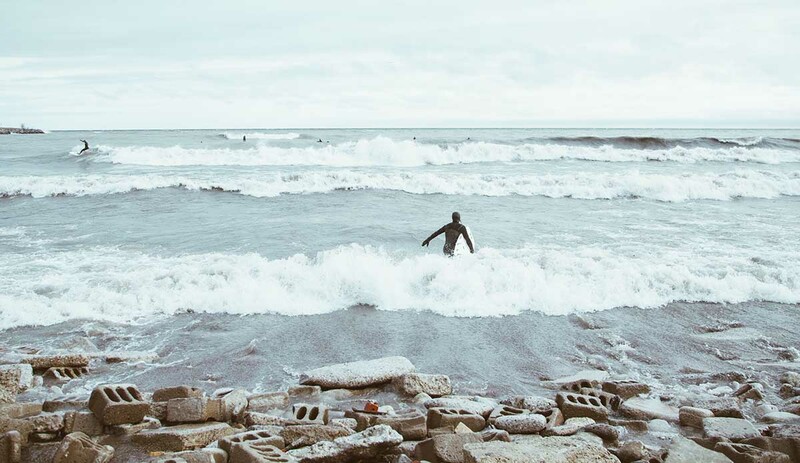 For us, landlocked, urban surfers, Great Lake surfing provides a medium to balance the rhythm of our urban existence and a platform to interact with our natural environment. I often get asked how the lakes compare to the ocean. The honest answer is comparison itself is the thing that keeps us from enjoying life for what it is. If you want a technical answer, I can say the absence of salt makes it harder to float and paddle and wind swell makes for choppy and mushy conditions most days. These swells, resulting from strong low-pressure systems, are short-lived, so you really have to know where and when to surf to score decent waves. Searching for the perfect wave applies here just as anywhere else and we are always exploring beyond the next point. This ephemeral and uncertain quality is the perfect setting for a tight, collaborative, and positive community – one I haven’t seen anywhere else in my three decades living and surfing all over the world. 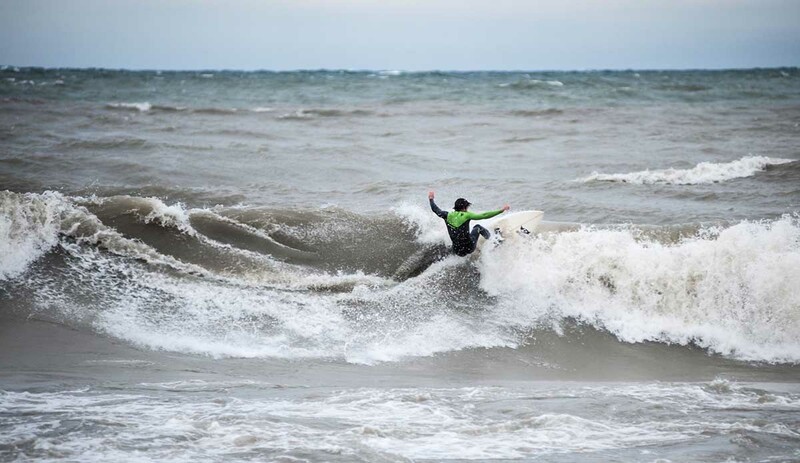 People have been surfing on the Great Lakes since the 1960s but in the past decade, we have seen a vibrant scene emerging with new shops, schools, competitions and community initiatives spanning from Kingston to Duluth and everywhere in between. We honor and respect the pioneers who have been surfing here for decades setting the stage for this scene to flourish. We have our own kooks and celebrate and support them; besides, we are all kooks one way or another. We have plenty of self-proclaimed meteorologists who could have an honorary degree in Atmospheric Sciences. We also have inventors shaping their own boards, and an ever-growing community of explorers riding various shapes, styles, and sizes. Moreover, we have a real community of surfers that span generations, celebrating surfing in its most basic essence, every season of the year. Our surf season starts in the Fall, as the air and water begin to cool and storms move through the region. November gales bring some of the biggest swell and mark the transition into winter. The first snowstorm is a celebration of our love for cold water; those who paddle out are rewarded with stunning scenery and unforgettable sessions. These are the days of icicle beards, thigh-deep snow, and surfing next to icebergs in the lineup. When the temperature returns to the positive digits in March, we celebrate surviving another winter, and getting into a 4/3 feels like ‘trunking it’ in the tropics. Spring is time to give back and clean our beaches from all the debris that washed ashore during the winter. 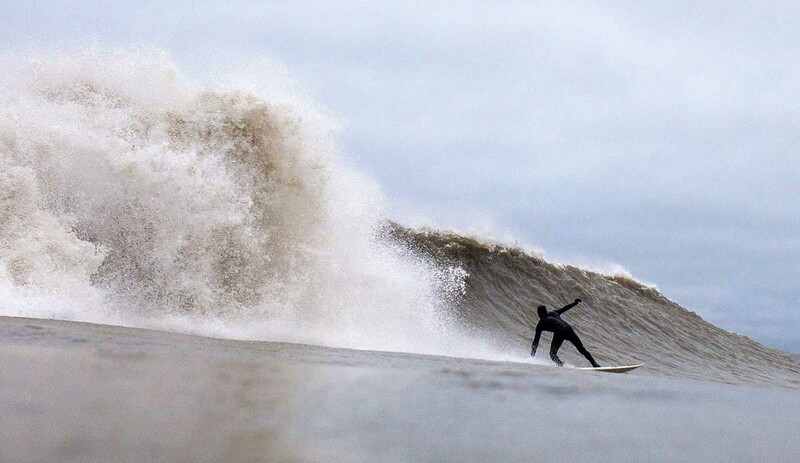 Lake Ontario goes flat in the summer months, forcing us to flock to Erie, Huron, and Georgian Bay where we ride ankle-biter waves – sometimes in board shorts. For the most part, Great Lake surfers don’t take themselves too seriously. We are a community of misfits from an extensive geographical radius who spend most of our free time obsessing over weather forecasts for those occasional short sessions. Our scene is still in its infancy but we’ve seen a lot of progress in terms of access to equipment and education, and have noticed a significant shift towards more inclusivity and support. We have also noticed an ascent in the actual level of surfing, with the influx of expats from places where riding waves is the norm. It’s hard to predict the future, but we hope to continue seeing this organic growth on the Great Lakes. We would love to see more competitions, events, and crossover between rivers, lakes, and surfers from all over the continent. With our current environmental crisis, we hope to continue working with organizations, policymakers, and our community to protect this magnificent natural resource that keeps us alive and stoked. Over and above that, we look forward to continuing finding the positive side in life and chasing the endless winter surfing lifestyle in such a unique place like the Great Lakes.